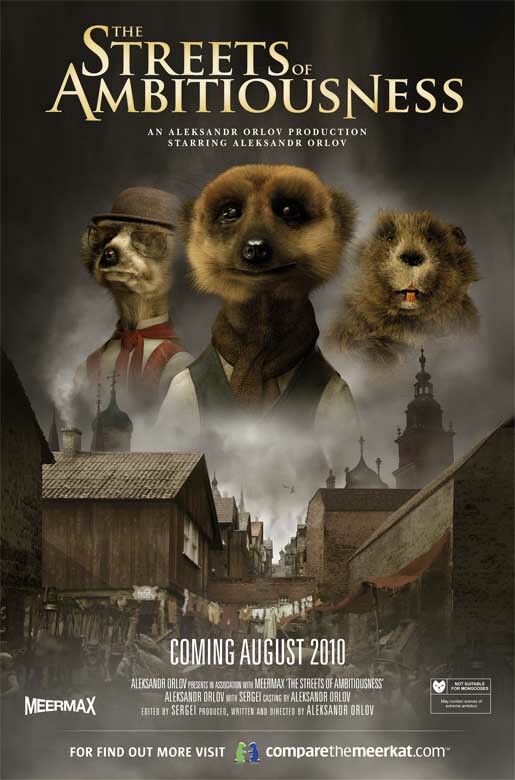 Compare.com’s Meerkat campaign has gone to Russia to trace the roots of Aleksandr Orlov’s online business with a series of three 60 second films, online at film.comparethemeerkat.com, complete with movie posters, trailers and directors commentaries. The Russian mascot for the “Compare the Market” campaign takes us back to the origin of his site by recounting his family history in a trilogy. “The Journey of Courageousness” shows us meerkats leaving the Kalahari Desert during a famine to sail to Russia. “The Battle of Fearlessness” celebrates a historic battle between meerkat and mongoose armies in the Ural Mountains. “The Streets of Ambitiousness” takes us to Aleksandr’s father comparing meerkat photographs in Moscow. Check out the Facebook page, YouTube channel and Twitter channel.